INTERNAL AUDIT, MONITORING AND INVESTIGATIONS DIVISION. 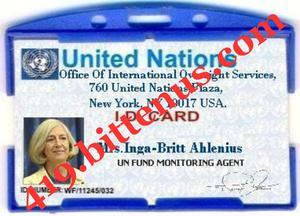 UNITED NATIONS FUND MONITORING OFFICER. CONGRATULATIONS, THE WORLD BANK AUDITORS ARE PRESENTLY IN WEST AFRICA TO RELEASE ALL UNPAID LOTTERY AND INHERITED FUNDS IN WHICH YOUR PAYMENT IS AMONG. THE WORLD BANK TEAM HAVE MET WITH THE CENTRAL BANK FOREIGN PAYMENT OFFICER WHO CLAIMED IGNORANT OF DELAYING YOUR FUNDS IN THE PAST BUT HAS PROMISE TO MAKE SURE THAT YOU AND OTHER FUND BENEFICIARIES RECEIVE YOUR PAYMENT WITHIN THE NEXT 48HRS. YOUR PAYMENT FILE HAVE BEEN APPROVED AND HANDED OVER TO MR. CHIM OF THE DEBT SETTLEMENT UNIT WITH A PART PAYMENT OF $1.5M APPROVED TO YOU VIA ATM CARD PAYMENT, THE $1.5M HAVE BEEN PROCESSED AND PROGRAMMED IN YOUR NAME WITH ATM CARD# 5988241476163496 AND HAS BEEN PACKAGE FOR IMMEDIATE DELIVERY TO YOU; THE ATM CARD HAS NOT BEEN DISPATCH TO YOUR ADDRESS BECAUSE THE DELIVERY AGENT IS STILL WAITING FOR YOUR ATM COURIER FEE TO DELIVER THE ATM PACKAGE TO YOUR DESTINATION ADDRESS. THE ATM CARD IS NOT A CREDIT CARD, IT IS AN AUTOMATED TELLER MACHINE CARD (ATM CARD) THAT WORK IN ALL BANKS WITH DULY INTER-SWITCH, THE WORLD BANK UNDER THE MINISTRY OF FINANCE WITH THE WORLD BANK GROUPS AND IMF (INTERNATIONAL MONITORY FUND) HAS ADOPTED THIS ADMINISTRATIVE MEASURE OWING TO VARIOUS COMPLAINS/PETITIONS RECEIVED FROM BENEFICIARIES DUE TO THE DELAYS IN RECEIVING THEIR INHERITANCE FUND AS EXPECTED, IT WAS ALSO ADOPTED TO REDUCE THE ADMINISTRATIVE PROTOCOLS AS WELL AS FRAUD PERPETRATION. YOU WILL BE ALLOWED TO WITHDRAW $10,000.00 PER DAY FROM THE ATM CARD IN ANY ATM MACHINE CENTER OF YOUR CHOICE AS SOON AS YOU RECEIVE THE ATM CARD, IT IS ALSO IMPORTANT TO LET YOU KNOW THAT YOU ARE URGENTLY REQUIRED TO PAY THE COST OF THE ATM CARD COURIER FEE AS STIPULATED BY THE WORLD BANK AUDITORS, THIS IS BECAUSE YOUR $1.5M ATM CARD IS PROTECTED BY AN INSURANCE BOND POLICY THAT MADE IT IMPOSSIBLE TO DEDUCT THE COURIER FEE FROM THE APPROVED PAYMENT BEFORE DELIVERY TO YOU. THE DISPATCH OFFICER HAS MADE DELIVERY ARRANGEMENT AND THE COST OF DELIVERING THE ATM CARD TO YOU IS ONLY $198 BEING 24HRS/OVERNIGHT DELIVERY SERVICE. YOU ARE URGENTLY REQUIRED TO SEND THE ABOVE $198 COURIER PAYMENT VIA MONEY GRAM OR WESTERN UNION IN THE NAME OF THE DISPATCH OFFICER (PHILIP JOY) IN NIGERIA AS DIRECTED BELOW AND FORWARD DETAILS OF THE COURIER FEE TRANSACTION TO MR. CHIM OF THE DEBT UNIT FOR IMMEDIATE DELIVERY OF YOUR PAYMENT TO YOU, ALSO FORWARD TO MR. CHIM YOUR DELIVERY ADDRESS WHERE YOU WANT THE ATM CARD DELIVERED TO ENABLE HIM HANDLE & CORDINATE YOUR DELIVERY EFFECTIVELY TO AVOID ANY MISTAKE DURING DELIVERY OF YOUR ATM CARD PAYMENT TO YOU. URGENTLY SEND THE $198 COURIER FEE TODAY SO THAT THE COURIER AGENT CAN PROCEED ON THE DELIVERY OF YOUR ATM CARD BEFORE THE AUDITORS WILL LEAVE AFRICA, IF THEY RECEIVE YOUR DELIVERY FEE TODAY, YOUR ATM CARD PAYMENT WILL LEAVE TO YOUR DESTINATION FIRST THING TOMORROW MORNING AND WILL GET TO YOU NEXT DAY. HERE IS THE MONEY GRAM OR WESTERN UNION PAYMENT INFORMATION TO SEND THE $198 COURIER FEE, SEND THE $198 COURIER FEE TO NIGERIA IN THE NAME OF MR. PHILIP JOY AND FORWARD DETAILS OF THE TRANSACTION TO MR. CHIM IN THE UNITED STATES FOR RECORD KEEPING. AFTER PAYING THE FEES VIA MONEY GRAM OR WESTERN UNION, SEND A COPY OF THE FOLLOWING PAYMENT INFORMATION (1. SENDER'S NAME, SENDER'S PHONE NUMBER AND ADDRESS, 2. MTCN NUMBER OF THE PAYMENT, 3. TEXT QUESTION & ANSWER) TO MY EMAIL AND A COPY OF THE INFORMATION'S TO MR. CHIM (DEBT SETTLEMENT OFFICER) VIA BELOW EMAIL CONTACT FOR IMMEDIATE DELIVERY OF YOUR ATM CARD PAYMENT TO YOU. FORWARD THE $198 COURIER PAYMENT DETAILS TO MR. CHIM VIA BELOW EMAIL CONTACT. ATTACHED IS MY IDENTIFICATION FOR RECORD PURPOSE. I AWAIT YOUR IMMEDIATE CONFIRMATION AS SOON AS YOU SEND HIM THE COURIER FEE. THE WORLD BANK TEAM HAS MET WITH THE CENTRAL BANK FOREIGN PAYMENT OFFICER WHO CLAIMED IGNORANT OF DELAYING YOUR FUNDS IN THE PAST BUT HAS PROMISE TO MAKE SURE THAT YOU AND OTHER FUND BENEFICIARIES RECEIVE YOUR PAYMENT WITHIN THE NEXT 48HRS. YOUR PAYMENT FILE HAS BEEN APPROVED AND HANDED OVER TO MR. CHIM OF THE DEBT SETTLEMENT UNIT WITH A PART PAYMENT OF $1.5M APPROVED TO YOU VIA ATM CARD PAYMENT, THE $1.5M HAVE BEEN PROCESSED AND PROGRAMMED IN YOUR NAME WITH ATM CARD# 5988241476163496 AND HAS BEEN PACKAGE FOR IMMEDIATE DELIVERY TO YOU; THE ATM CARD HAS NOT BEEN DISPATCH TO YOUR ADDRESS BECAUSE THE DELIVERY AGENT IS STILL WAITING FOR YOUR ATM COURIER FEE TO DELIVER THE ATM PACKAGE TO YOUR DESTINATION ADDRESS.